Native to North America and discovered by the Indians, it is the ingredient in the famous Oswego tea. The Oswego Indians brewed the Bee Balm leaves into a refreshing tea for stamina and for medicinal purposes. The Oswego Indians introduced white settlers to the health benefits and it became quite popular with them. Herbalists recommend an infusion of Bee Balm for coughs, sore throats, flatulence and menstrual cramps. Scientists have found that the oil extracted from Monarda didyma and M. punctata contains thymol, which is an antiseptic against fungi, bacteria and some intestinal parasites. Many a Native American and settler took the “purge” of drinking enormous quantities of Oswego tea in hopes of expelling hookworms. This is not recommended by modern herbalists. The taste of Bee Balm is reminiscent of citrus fruit, a cross between an orange and a lemon. Use the leaves fresh when poaching seafood, or dried in herbal teas. Chop fresh leaves finely and sprinkle over strawberries and melon. Add the dried leaves and flowers to potpourri and sachets for a citrusy fragrance. Bright crimson in color, the flowers of the Bee Balm are a magnet for butterflies, bees and hummingbirds. Not only does Bee Balm come in crimson, but also in shades of pink, white, lavender and several shades of red. It is the crimson flower that attracts the Swallowtail butterfly. Bee Balm is a member of the mint family, but lacks the “runner” quality so it does not spread in the garden like the other mints. 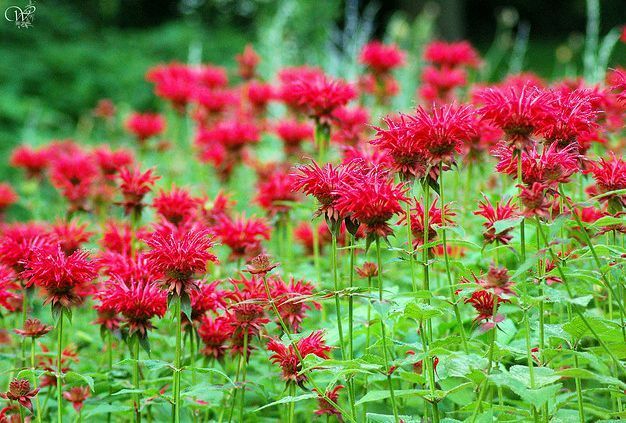 Bee Balm is considered a perennial and if not over-harvested will produce scarlet clusters of flowers for several years. Plants can reach a height of 3 feet under ideal growing conditions. Does best in a sunny location with fertile soil. I would recommend growing plants in place of seeds, as many of the seeds will revert to something not like either parent plant. And after the second or third growing season, you’ll end up with a not so attractive plant lacking color and flavor. Harvest Bee Balm in mid-summer. Cut it down to within 1 inch of the ground. Strip the leaves from the stems and lay them to dry single file on paper towels. Turn the leaves often, and when they are dry, store them in glass jars. Some species of Bee Balm: Monarda citriodora, pink-purple blossoms, strong lemon scent, very flavorful for tea. Monarda didyma- Adam, red blossoms. Monarda didyma-Snow Maiden, white blossoms. Monarda didyma- Pale Ponticum, lavender blossoms. The hum of the bee is the voice of the garden. Let us hope we will always hear the hum. ~ Blessed be, sweet ones.